An awful lot of green outfits. 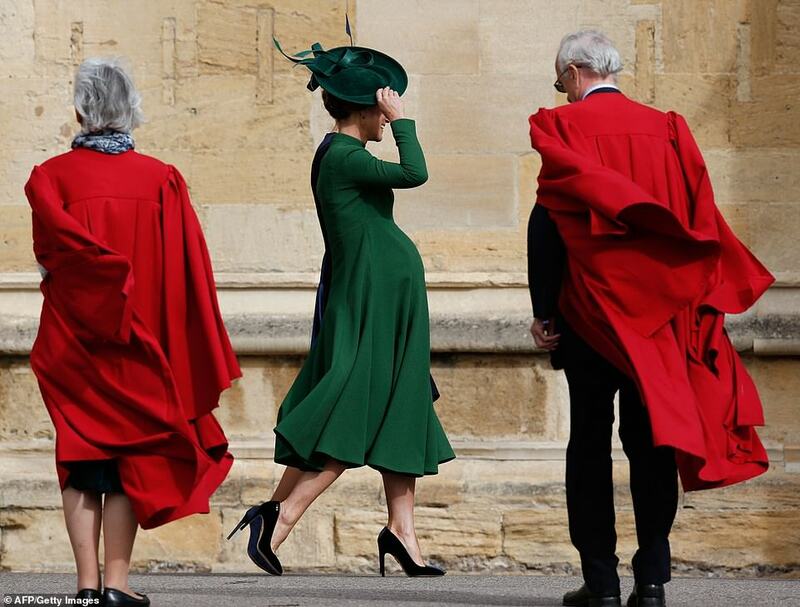 To the superstitious, green is for bad luck, let’s hope not and that Eugenie had her some borrowed, something blue etc on. I agree about the cost being borne by the taxpayer. PA asid in his interview it is not a public event but a famiiy wedding - he is a big hypocrite. I think it's a real shame that so many details of the wedding were ripped off from H&M. It would have been better (and cheaper) to marry in the chapel on Andrew's estate, and to skip the Windsor part altogether. Eugenie was a stunning bride, as I knew she would be. Loved everything about this wedding. ^^ I love a country wedding, myself. I think a wedding at home, where she grew up, would have been lovely. It also would have been a way to stand apart from the pack, to remind MM of her roots, if that was her (her father's) desire. Meg curtsey, is she going to fall over? Chelsy doesn't deviate from navy does she? Why does Pips have three legs and two colour shoes? I think Pippa is walking side by side with someone else. ETA: On second thought, it looks like a shadow or some kind of photoshop issue. Charlotte and George look like such beautiful children. Charlotte is growing up to be quite the beauty. You can see it in the videos and on the telly during the ceremony. She looks so much different on video and nothing at all like Council Carol(e)! Nothing! Neither child looks Midds or Winds and I don't believe Louis will, either. But they are adorable children. 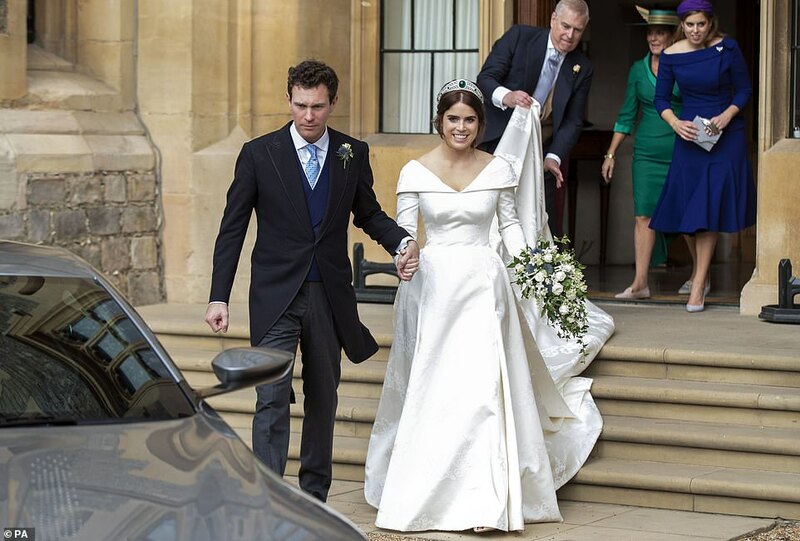 Princess Eugenie looked simply gorgeous. And Jack looked extremely happy. Put this on the wrong post earlier. I did not realize that Pippa and Chelsey were friends with Eugenie. Did all the midds get invited? The more I look at the wedding gown, the more beautiful it is. The music was so lovely, too. This is the first royal wedding that I’ve enjoyed for a very long time. Good job! From article. A little giggle. Love Zara. 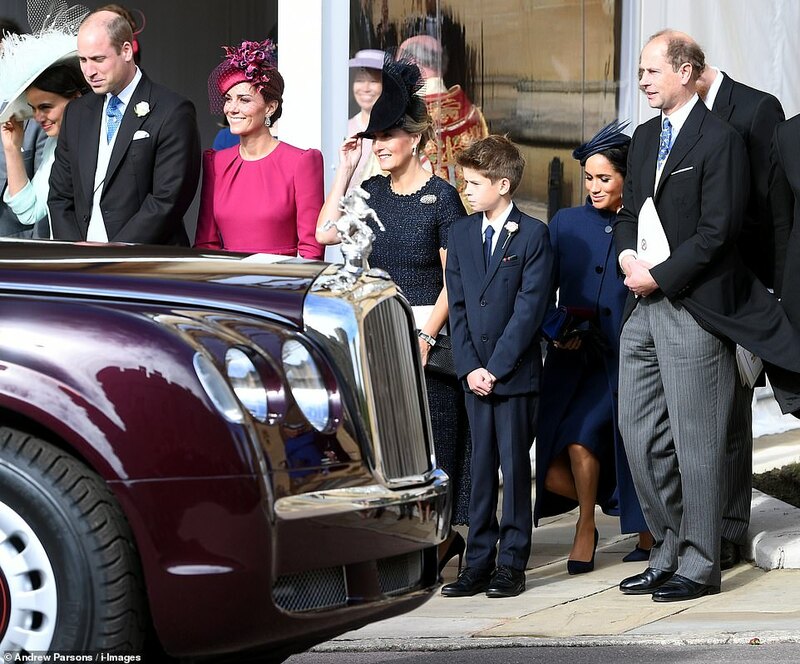 The ceremony was more muted than Harry and Meghan's in the same venue just five months beforehand, with Zara Tindall telling the Duke of Sussex 'it's very quiet compared to the screaming at your wedding'. ^ omg I love that quote. And for that reason I think both weddings were very different. I do not think Eugenie copied Harry at all. Carole Middleton genes dont fail EVER - her daughters ARE THE SAME! She probably meant the crowds screaming. ^I'm not sure about that. If you look at Mike's face after she said that, it looks like she was throwing some shade. Who knows about the screaming? Could be the crowd, the preacher, the choir, Murky, or Hazza himself. 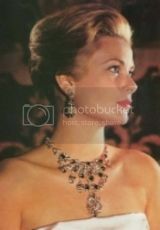 The neckline was perfect. A small veil would have looked nice. 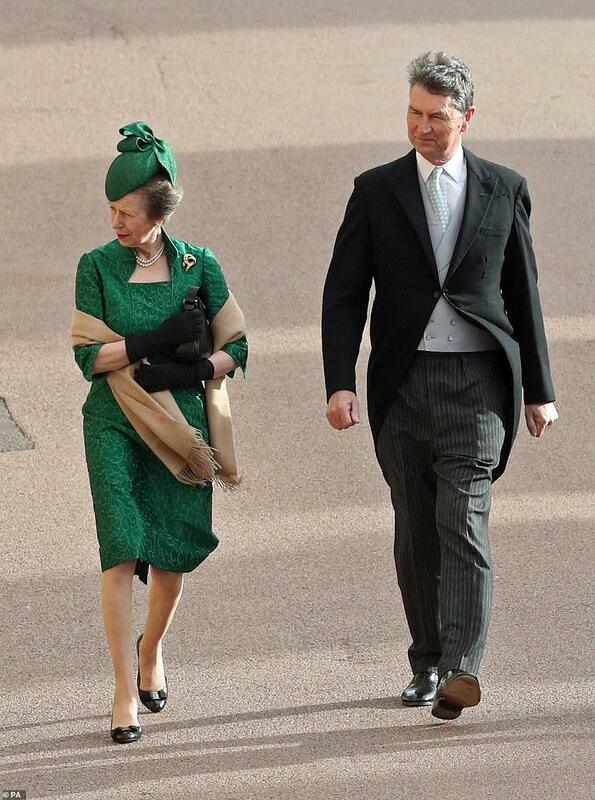 The gown was a trifle roomy something like Diana's but it did not have those puff sleeves. Overall nice for her. I rate this gown nicer than Kate's (which I found meh) and Meghan's. Something really appealing and original about it. I liked to see George laughing. I wish Charlotte would lighten up and have fun too. People online are speculating she took inspiration from Sleeping Beauty, as in the Disney movie. I don't have an opinion there, I just thought it interesting. You know, I'm disgusted at how Kate and William are NOT raising their kids to handle publicity responsibly. Charlotte and her brother are not raised to behave on the balcony and it should be clear that neither are aware of how to behave well anywhere. All that time on her hands and Kate clearly hasn't been raising her daughter properly. Why was Pippa even there? 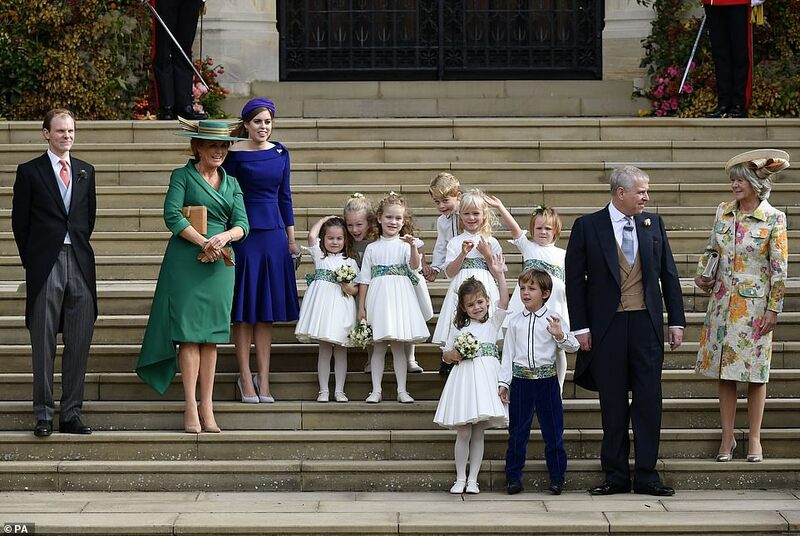 Christ, I get it that the MIdds just LURRVEEE being at royal events, but Pippa has no real legitimate right to be at that wedding considering the hostility towards the Yorkies and the hostility from the Yorkies. Disagree, those children are not cute or beautiful in any way. Charlotte is growing up to look as mean and cold as Council Caro. Looks like one of those children with nothing special about them who only THINK the world revolves around them. Not close to adorable IMO. Not very well-mannered or well brought up either. Eugenie looked regal and quite dignified - now SHE was a beautiful child. I understand James M. was there. Or so the press said. Pippa wants to be in the limelight so badly.